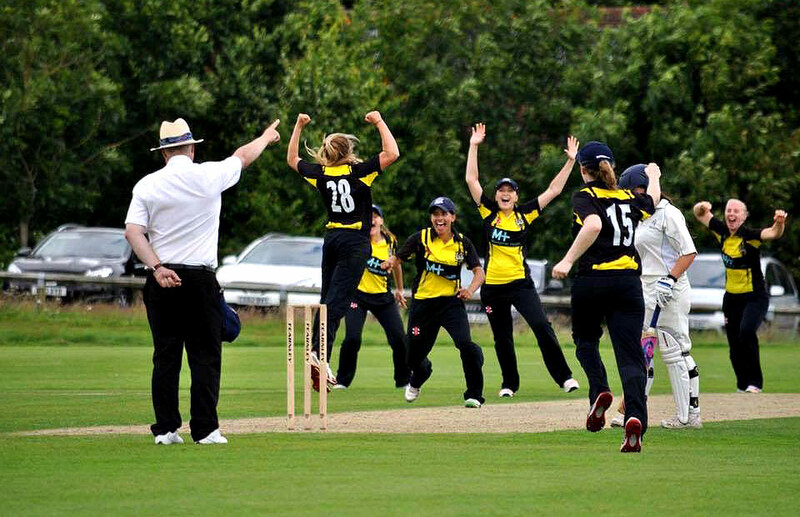 Gloucestershire Women won promotion back to Division 3 of the T20 County Championship at the first attempt with emphatic victories over Buckinghamshire and Dorset. Less than 12 months after suffering relegation the young squad bounced back in style in the double-header at Marlborough College. In the first game of the day Glos won the toss and after choosing to bat lost Naomi Forecast (Bristol Phoenix) with the total on four. Abby Evans (Bristol Phoenix) and Bethan Moorcraft (Newport) led the recovery to 48 before the latter was bowled for 15. Bhavi Devchand joined Evans and the pair took the attack to the Buckinghamshire bowlers. Evans passed 50 off 35 balls as both batters ran hard and between them struck 20 boundaries. Evans reached her hundred off 76 balls with 14 boundaries before being run out coming back for a two. Shortly before the close Devchand reached 50 off 33 balls, eventually ending up on 57 not out as Glos posted a massive 190-3 from their 20 overs. In reply Buckinghamshire never looked like getting anywhere near as the Glos bowling and fielding matched its usual high standard. Devchand followed up her unbeaten 50 by taking 4 -6 from four overs with catches from Alice Hill and Abby Evans. Mollie Robbins (1-4 ) (Hanham) and Eve Alder (1-8) (Cirencester) chipped in with a couple of wickets before the real highlight of the innings. Alice Hill (Hatherley and Reddings/Bristol Phoenix) came on to bowl in the 14th over and immediately took a wicket courtesy of a catch by Danielle Gibson (Dumbleton) at short extra cover. In her second over, she bowled Ayre and then repeated the act to bowl Duggan the very next ball. With the field crowded around Mowatt for the hat trick ball, Hill trapped her LBW for a brilliant hat trick and wild celebrations from the whole team. Bucks were bowled out for 49 to give Glos a thumping 141 run win. In their second game, Gloucestershire comfortably beat Dorset to seal promotion back to T20 Division 3. Charlie Walker (Bristol Phoenix) lost the toss for the first time in 2016 and Dorset chose to bat. Despite not hitting the heights of previous games, the Glos bowlers and fielders restricted Dorset to only 58 from their 20 overs. Off spinners Charlie Phillips (1-11) (Bath) and Hill (1-7) kept things tight in the middle overs and there were wickets for Alder (1-7) and Sidra Khan (1-12) (Bristol Phoenix). The bowling highlight was provided by Gibson (3-9) who took three wickets in her 4th over – all bowled – showing her ability to destroy the tail at the end of an innings. Chasing just 59 to win, Gibson and Forecast ruthlessly chased down their target in only 7.4 overs. Both put away the bad ball and ran well between the wickets. Danielle finished on 30 not out from 23 balls with three boundaries while Naomi scored 27 not out from 24 balls with four fours. The one slight dampener for Glos is that Australian overseas player Bhavi Devchand has played her final match.